What is the PERMUTATIONA Function? The PERMUTATIONA Function is a Statistical functionFunctionsList of the most important Excel functions for financial analysts. This cheat sheet covers 100s of functions that are critical to know as an Excel analyst. It returns the number of permutations that are possible for a specified number of objects in a given set. Introduced in MS Excel 2013, it’s important to note the function includes repetitions in the number it returns. Number (required argument) – It is an integer that describes the total number of objects. 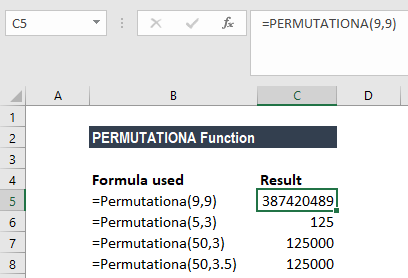 How to use the PERMUTATIONA Function in Excel? We wish to calculate the number of permutations (with repetitions) of six objects, selected from different sized sets. PERMUTATIONA(50,3) and PERMUTATIONA(50,3.5), that is 125000 possible permutations. Combinations and permutations are different and, hence they use different formulas. In a combination, the objects can be in any order, whereas in a permutation, the order is important. Both the PERMUT and PERMUTATIONA functions calculate the number of permutations of a selection of objects from a set. However, there is a difference between the two functions. PERMUT does not count repetitions whereas PERMUTATIONA counts repetitions. For example, in a set of three objects – a, b, and c – how many permutations are possible? #VALUE! error – Occurs when “number” or “number_chosen” is not numeric. The supplied number argument is less than the number_chosen argument.